PCR-grade water | Tamar Laboratory Supplies LTD.
PCR-grade water is an essential reagent for all areas of molecular biology research and diagnostics. 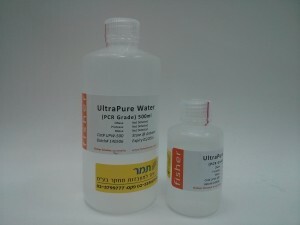 The Ultra Pure Water undergoes 0.1µm filtration, delivering compatibility with CE (Capillary Electrophoresis) applications. Like all components of a PCR, Real-Time PCR or RT-PCR assay, the water component must be of a very high purity. Standard laboratory water (autoclave sterilized) is often contaminated with DNA, RNA, nucleases or a variety of microorganisms. These contaminants often contribute to suboptimal amplification results. One have to remember that water could cause problems with PCR reactions (especialy Real-Time PCR), ligations and other molecular biology experiments. PCR grade water, should be aliquoted into smaller volumes to minimize the chance of contaminating the entire stock. When aliquoting reagents into other containers or vials, be sure that these are sterile and DNase/RNase-free.